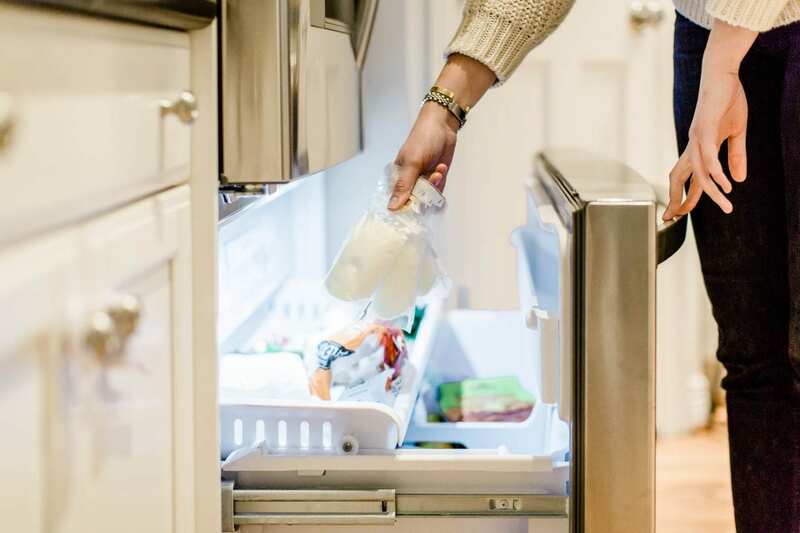 Did you pump so much milk that you now have a freezer full of breast milk and don’t know what to do with it? So often I read about moms tossing out hundreds and thousands of ounces of breast milk. Stop right there! Don’t toss out all that hard work. Put that milk to use! Here are 10 things you can do with frozen breast milk. 1. Feed your baby when you’re out and about. When you know you have extra breast milk and you won’t get engorged from pushing out a nursing session, or you simply need milk to bribe your infant while you’re out, take a bottle and some previously frozen breast milk with you and feed your baby. Then once you get home you can pump and freeze some fresh milk to use several months down the road. 2. Breast milk doesn’t have to be consumed as a liquid. You can actually make ice cream out of breast milk or toss it into the blender with some fruits and vegetables for a delicious smoothie to feed your infant or even an older child! Often, you have to pour a liquid in the blender to make it work properly as it blends fruits and vegetables, anyways, so instead of using water or whole milk, defrost some breast milk and pour it in for a healthier option for your child. 3. Make some breast milk popsicles. Not only are these healthy, but they often provide relief to a teething baby. Whether you’ve mixed in some fruits or vegetables or just kept it plain, chewing on a breast milk popsicle is much more rewarding than chewing on a frozen silicone or gel toy. You can even put breast milk ice cubes in a mesh fresh food feeder, or a silicone feeder to help provide relief to your teething baby. 4. Defrost some breast milk to use with baby cereal. Why use water when you have a stash of milk?! Baby cereal is known to provide iron as well as to help babies put on weight, and while mixing in some breast milk is beneficial to all infants, it can be a really great idea for those who won’t breastfeed but will eat the milk in foods like cereal. 5. Donate extra breast milk. Did you know that there are organizations that will accept your frozen breast milk for donation? No, it does not need to always be fresh, you can definitely donate frozen milk instead of throwing it away. Contact local organizations such as La Leche League or your local hospital for more information on how you can donate breast milk and help families in need. 6. Breast milk does not always need to be used as a food. As a source of vitamins, proteins, and fats, giving your child a milk bath can be both healthy and make for a fun photoshoot. 7. Does your child have eczema? The fats and proteins in milk leave your baby’s skin soft. Aside from using it in a milk bath, you can make lotion, soap, or chapstick to help soften your baby’s skin. 8. Put it in baby’s eyes. Breast milk can also clear up your baby’s gooey, red eyes. Make sure it’s the right temperature and use as eye drops. I’ve seen my infants eye go from swollen and red to perfectly normal in under 24 hours, so I’m telling you from experience! It’s harmless to your babies eyes, gets the gunk right out, and is much easier to wipe off your baby’s eyes than using water and a washcloth and having to rub your baby’s eyes. 9. Use for stuffy noses. Is your child congested but you can’t understand all the ingredients used in saline drops? Just put a couple drops of breastmilk to clear that baby right out. It’s a much gentler liquid than saline and doesn’t come with a list of ingredients. 10. Breast milk isn’t just for babies! You can even use breast milk on your own skin or eyes, or on an older child’s for the same benefits! Don’t let that liquid gold go to waste, mamas!